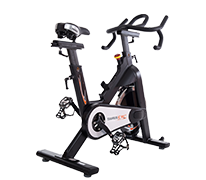 The Kettler indoor bike Speed 5 Biketrainer is a fitness equipment of commercial quality. It has a very stable frame construction. The sitting position is infinitely variable for exercising like on a racing cycle. The balance mass of 18 kg has a premium ball bearing for a very joint-gentle concentric run. The Kettler exercise bike Racer 9 incl. Kettler World Tours 2.0 is a high-quality racing exercise bike, which is especially developed for the ambitious cycling training at home. The innovative training software Kettler World Tours 2.0 provides a diversified training. The induction brake system of the Racer 9 generates resistances of up to 1000 Watt. The electronic gear shift offers a unique cycling experience. The Kettler Exercise Bike Racer S incl. Kettler World Tours 2.0 offers maximum resistance and the seating position of an indoor cycle and combines that with adjustment/setting options and the performance analysis of an exercise bike. The latest version of the Racer S is built with a high quality racing handlebar as well as Campagnolo shift grips. Additionally the Kettler World Tours 2.0 training software is also included in the package. The Kettler upright bike Biketrainer Racer 1 offers an optimal opportunity to start cycling at home thanks to a freewheel and an infinitely variable resistance. The Kettler upright bike Biketrainer Racer 1 is silent, offers a good concentric run, and displays the most important training data. 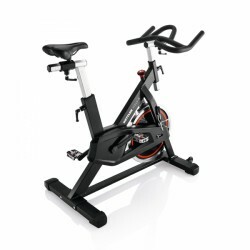 The Kettler indoor bike Racer 3 Biketrainer is a sturdy indoor bike for regular training at home. The sturdy frame of the Kettler indoor bike Racer 3 Biketrainer makes a maximum user weight of 130 kg possible. The saddle is vertically and horizontally adjustable for comfort while exercising. Very good for the price. Easy to assemble, quiet. No problems so far. 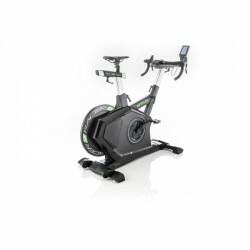 Being one of the leading manufacturers for bikes, Kettler contributes a lot of know-how to the construction of high-quality indoor cycles and indoorbikes. Of course, there's a big difference between bikes and fitness equipment: bikes serve the locomotion, pedalling on a Kettler indoor cycle you are not getting anywhere. 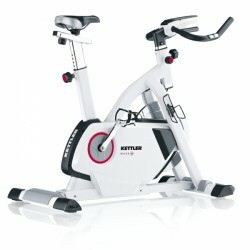 Though you get quicker in shape on a Kettler biketrainer amd exercise independently of wind and weather. There are also many technical common features and the experience of many years, which Kettler has for producing bikes - both profitably transferred to the construction of Kettler indoor cycles. Fitness equipment for bike training fulfill even high demands of professional cyclists. Kettler offers a wide range of indoorbikes. It starts with the uncontested top model, the Kettler Racer S, which demands even top athletes with its enormous range of performance and offers really new training possibilities with its control per S-Fit App. It includes the Kettler Biketrainer Racer 3, providing a 18 kg flywheel and producing resistance per maintenance-free magnetic brake system. 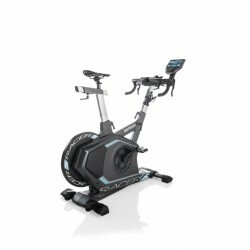 This indoor cycle can even by controlled by a training computer.